Place sweet potatoes and water to cover. Heat to boiling. Reduce heat; cover and simmer 25-30 minutes, or until tender. Drain potatoes and cool slightly. Peel under cold water. Cut into large chunks, and place in 8 x 8 casserole. Preheat oven to 350. In a small saucepan, melt butter. Stir in syrup and sugar over low heat for 3-5 minutes. 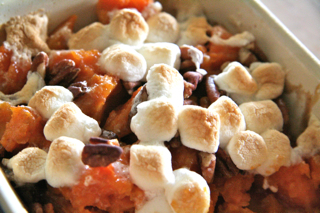 Sprinkle nuts over sweet potatoes and top with syrup mixture. Bake 25 minutes. Top with marshmallows. Bake 5-7 minutes.